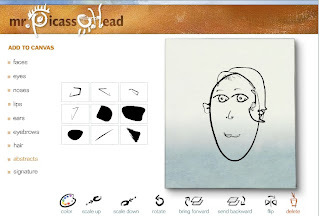 If you have artistic students who like to draw faces, Mr. Picasso Head will be a great tool to let them explore their creativity. This flash application is very simple. You get to choose a face, eyes, nose, lips, ears, eyebrows and hair and you drag them and move them to give your face a unique look. Each element of the drawing can be rotated, flipped, scaled up and down, and coloured. As with any good graphic application, there are layers that can be used to decide what will be in the foreground and background.